Having set up shop in both London and Helsinki, PC Connects is looking to break America in 2019. We're heading to home of Starbucks, grunge and - helpfully - Microsoft, Seattle on May 13th and 14th of this year, with one full day of talks and insight from the biggest names in the PC games space. We're going to have four tracks at the show. State of Play will give attendees an idea of what the PC games landscape looks like right now, while Digital Discovery will provide insight into getting your project noticed in an ever-saturated marketplace. The CodeShop is our design and development track, taking our guests behind the scenes on making games. Finishing up the day is The PC Revolution, fresh from its debut at PC Connects London 2019, which is going to be examining the emerging trends, tech and markets that are going to change the PC games industry in the coming years. If you are interested in speaking, please get in touch with [email protected] and [email protected]. And if you are interested in sponsoring the show or looking into what we can offer from a commercial side of things, [email protected] is your man. 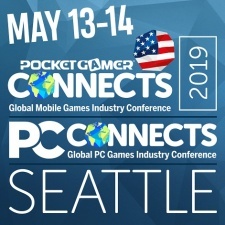 Oh, and if you were curious, this year's Pocket Gamer Connects London 2019 - featuring PC Connects London 2019 - was a massive success!